Clever stunt or flagrant abuse? 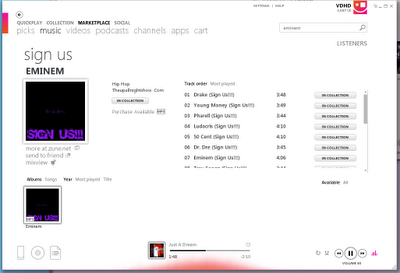 A hip hop group calling itself "Sign Us" has invaded the Zune Marketplace, naming each of their songs on their only (debut?) album "Eminem" after popular hip hop artists, and adding "(Sign Us!!!)" possibly to attract A&R attention. This keyword inflation has been common in search engines for years, but is this a start of a similar practice on the Marketplace? Neither iTunes nor Rhapsody seems to have been graced by these budding entrepreneurs, who seem to have taken their name from the recent Drake song (or the Johnson & Johnson song, or possibly any number of other references). So the question is, why Zune? It's no question that the strategy seems to be working. At least, searching for Eminem returns the Sign Us LP as the first result in albums section, as well as several tracks when searching for artist titles. The music seems to be of questionable quality, and the musical style of each track seems to have a tenuous connection to their namesake artists. Maybe a smaller label will reward the group's creativity, and have the good graces to pull the album or re-release it with proper titles. Until then, hopefully some of the mystery behind these odd search results will be solved.